At FBC, we respond to Psalm 100’s invitation to “make a joyful noise unto the Lord” through our music in worship each Sunday. 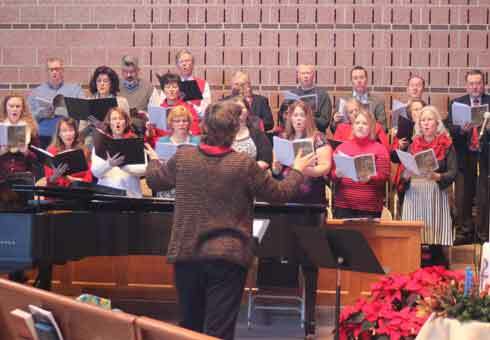 Adult Choir Director, Dr. Cheri Grizzard, along with our Praise Team, organists, choirs, and other instrumentalists, all share their gifts of music through a wide variety of musical selections each and every Sunday. Music at FBC ranges from traditional pieces to lively gospel anthems, from Taize meditations to contemporary Praise songs. The Praise Team leads us in praise songs and traditional hymns as part of a blended service. The Sanctuary Choir welcomes youth and adults to rehearse Wednesday evenings from 7:30pm – 8:30pm and Sunday mornings from 8:45am – 9:15am during the months of September through May. The Praise Team rehearses on Wednesday evenings from 5:45pm – 6:30pm as well as on Sunday mornings from 8:15am – 8:45am. Our children and youth also share their musical talents on a regular basis during worship. They learn and practice singing, and ringing choir chimes and bells, as a part of the LOGOS Ministry. They also sing, dance, and act as they perform a children’s musical during the LOGOS program year. If you play an instrument or enjoy singing and would like to share your gifts, there is a place for you in FBC’s music ministry! Please contact the church office for more information. To support our Fellowship Fund for those with special needs, please consider online giving.